Editor's note: This is the first in a three-part series that introduces The Texas Coastal Exchange (TCX), a trading clearinghouse involving the sale of ecological services. Click here to read part two of this series. The SSPEED Center (The Center for Severe Storm Prediction, Education and Evacuation) at Rice University has been working for some time on a non-structural flood control concept that was initially intended to create new economic opportunities for the owners of land lying below the 20-foot elevation line in the greater Houston-Galveston area. This land is subject to inundation by hurricane surge flooding and, if developed, could suffer significant future surge flooding damage. In studying Hurricane Ike, the third costliest of any Atlantic hurricane, the SSPEED Center team observed that millions of acres of ranchland were inundated and proved to be quite resilient. Little short-term and virtually no long-term damage resulted to this area in contrast to areas where housing and homes were inundated. Indeed, the saltwater wetlands and coastal prairies recovered to full ecological function and economic productivity after the September 2008 tropical cyclone. One method to avoid future hurricane flood damages on the Texas coast is to keep these ranches in land uses that can be inundated without incurring substantial damages. The approximately two million acre area originally targeted by the SSPEED Center for non-structural flood damage mitigation is shown in the darker shading on Figure 1. Figure 1. 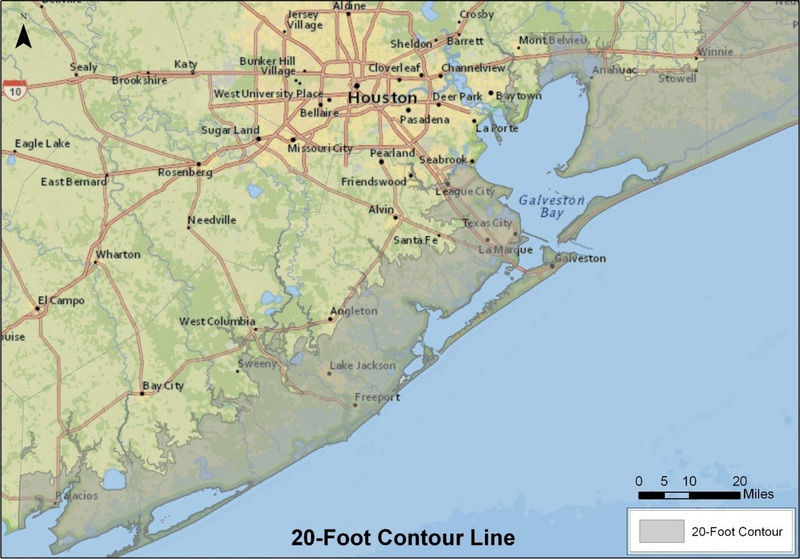 The area shown in gray lies below the 20 foot contour line, representing about two million acres in Chambers, Galveston, Brazoria and Matagorda counties on the Texas coast. In many areas of the United States, zoning or other land use controls might be proposed to keep natural, flood-prone areas from being developed. Land use regulations are unpopular on the Texas coast, however, and are unlikely to be adopted even if Texas county governments had the authority to implement such regulations. For this reason, the SSPEED Center research looked to private market-driven model to find a creative solution to protect these important natural areas. In seeking a market-based solution, the research focused on identifying additional sources of income that could be generated from land uses that could survive inundation as well as saleable items. This focus turned researchers toward new land management, cattle grazing, and stewardship concepts with the potential to generate positive economic activity. Here, researchers focused on ecological services, which are defined as the “goods” produced by natural ecosystems. Traditional ecological services familiar to landowners include raising cattle on grasslands, leasing land for quail or deer hunting, or selling timber produced by the land. Some of the less traditional ecological services include the storage of atmospheric carbon dioxide in soil and biomass, the reduction of flooding by storage of rainfall within the soil and wetland depressions, the enhancement of water supply by restoring and maintaining seeps and springs, and the enhancement of fish and wildlife values. With the development of this ecosystem services marketplace, economic and hazard resilience could be provided over large landscapes by restoring and maintaining ecological diversity and productivity. In order to enable this marketplace, the SSPEED Center has proposed to develop an entity called the Texas Coastal Exchange (TCX). The TCX is a trading clearinghouse where buyers and sellers could come together and enter into transactions involving the sale of ecological services. Research undertaken over the last three years has revealed the existence of several ecological services trading systems, some coming from regulatory requirements and some voluntary. Most of these existing systems, however, either were inapplicable to the Texas coast or had terms that would be unacceptable to Texas landowners. Additionally, many of these systems were overly complex. In response to these findings, the TCX was developed to be landowner friendly and relatively simple to join and implement. In evaluating the feasibility of such an ecosystem transaction economy, it became apparent to the research team that a long-term existential challenge faces the agricultural community. Rural communities have been losing population for decades, and some would suggest that our heritage of Texas ranching—if not farming—is in jeopardy. If a system could be developed to bring stability to this important agricultural community, then social benefits and economic benefits could be realized. And, as most of the economic opportunities identified by the SSPEED Center team involve restoration of native ecological systems, these opportunities not only enhance ecology but also address important societal resilience problems such as flooding, water supply, and climate change. As proposed, the Texas Coastal Exchange can implement a trading and cash flow system that will realize the “triple bottom line” of social, economic, and ecologic goals and, importantly, provide resilience on all three levels. In pursuit, therefore, of a non-structural flood damage reduction strategy, the SSPEED Center is proposing a multi-pronged trading system that captures the core concepts of stainable development. And, this system could become extremely important in the effort to address climate change. The basic concept of the TCX is straightforward. Landowners who are either currently or potentially providing ecological services would enroll in the TCX by initiating ecosystem service “testing” on their property, a step that we have labeled “planting the flag.” The enrolled property would then be described and registered on an official registry as intending to participate in ecological service transactions under the standards established by the TCX. No cash transactions would occur until a period of time had passed after the initial testing. At this to-be-determined time, testing would again be undertaken, and the relative increase in ecological service value determined. At that time, the landowner and a willing buyer could decide to enter into a sales transaction. In subsequent years, additional testing would be required prior to further sale of the property. Editor's note: Click here to read part two of this three-part series that introduces The Texas Coastal Exchange (TCX), a trading clearinghouse involving the sale of ecological services.